Ever wished your computer could be like it was when you purchased it? Well a system reload is the answer you’ve been looking for. A system reload is a process of wiping out the contents of your hard drive and then reloading the operating system back on to the hard drive. If you use an email program such as Outlook, Outlook Express or Windows Mail then you’ll want to backup your emails. Back up your favorites or bookmarks in which ever browser you use. Depending on the browser you use, you can also take screenshots of all the passwords you use on various sites. Firefox is such a browser. And any other program you use that has a backup feature built in to it, such as Quickbooks. So the keyword when conducting a system reload is backup. You can back up your stuff to an external hard drive, flash drive or online backup service. If you’re looking for a backup software there are both free and paid solutions. If you need a free one you can try Comodo Backup. Why do a system reload? Imagine this, you bought a computer a year or two ago, and every month since it keeps getting slower. You have downloaded a variety things to it. Installed and uninstalled several programs on to your computer. Maybe not been too careful and maybe even acquired some malware. Most likely, your computer is now considerably slower, and you want to throw it out the window every time you try to do anything with it. When things are at their worst, the best solution to your problems is a system reload. Do a little optimizing on the computer before we give it back. So if you want to get your system reloaded then get PC Pros 2 Go to do the system reload for you. 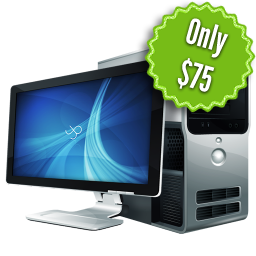 Get your system running like new for only $75.00, plus the service call fee. All in home service calls incur a $35.00 service call fee.